The Open Bore design of our MAGNETOM Espree accommodates patients of most sizes and eliminates anxiety and claustrophobia by allowing a patient's head to remain outside the scanner for most exams. But most importantly, the power is three times greater than the conventional Open and assures that you get the best images possible. Magnetic Resonance Imaging (MRI) uses a magnetic field and radio waves instead of x-ray to display many parts of the body, especially the brain, spine and joints. What makes it an Open MRI? Our Siemens Medical Solutions MAGNETOM Espree features a bore opening of nearly 2.3 feet in diameter and almost one foot of free space between a patient’s head and the magnet. The Espree also features the shortest 1.5 Tesla magnet available. Approximately four feet long, the magnet allows more than 60 percent of exams to be completed with the patient’s head outside the bore, helping to ease claustrophobia. The exam usually takes 20 to 45 minutes. It consists of several image exposures lasting 4 to 10 minutes each. You will be given music to listen to during the exam, but may also hear a muffled thumping noise during the exam as well. The most important thing to remember is to hold very still during the examination, as movement during the exams may result in blurry images. Some examinations require a contrast injection in order to enhance the ability of the MRI to see inside the body. The technologist will explain this procedure to you if your doctor or the Radiologist feels you would benefit from the information obtained with a contrast injection. No special preparation is needed. Eat normally and take medication as usual, unless your doctor has given you other instructions. You may find it easier to relax if you avoid drinking coffee or other caffeine beverages before your exam. Any metallic substance on your person can affect the quality of the diagnostic images. It can also cause discomfort or injury to you when placed in the magnetic field, and may exclude you from the exam. Also be sure to tell us if you are pregnant. In most cases an MRI exam does not require any injections. In some situations however, a substance known as a contrast agent may be needed to enhance the ability of the MRI to see into your body. All contrast agents are cleared by the FDA and are considered safe. 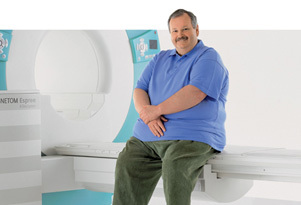 Open MRI is designed for the claustrophobic or anxious patient, children that need someone to sit with them, or large patients weighing up to 550 pounds. Some studies are more difficult to do on different patients. Very anxious patients and small children may be given a sedative to help them relax and lie still during the exam. If you think you will require a sedative, you will need to contact your physician and bring someone to accompany you home. With the Open MRI we are able to give the patients another choice to the traditional exam.